crafted like a dolphin to love the sea. This is the final issue of the 2007 volume of New Contrast. It is late, I hope for the last time. 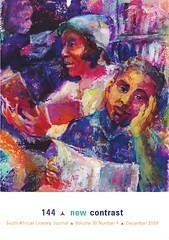 This is also the last cover of this set of my love, Sonja Wilker’s, paintings. I hope you have admired them as much as I have enjoyed sharing them with you. The 2008 volume will feature a new set of artwork and a new artist. 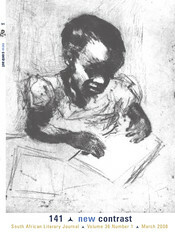 This issue also brings you an etching by Mimi van der Merwe whose work appeared in the Contrast volume of 1964. And a cartoon of Gus Ferguson’s. I hope you will enjoy the variations, too, in the age old battle of the genders – ever a hardy perennial in these gardens for these gardeners. There are a couple of interesting reviews too. Here are the editor’s note and four excerpts from New Contrast 139, available from better bookshops and by subscription now. Part two of Silke Heiss’ new verse novel, The Griffin Elegy, develops the tale set in the south peninsula. Meanwhile, Silke is hard at work on parts three to eight: the ominous tread of ed’s footstep always near. Recent years have seen a certain budding, if not flowering, of new writing (in this country). Novels sprout fungi-like from dark places wafting the rich odours of imaginations. Well, so it seems to me. And poetry, too: far from being put off by the understandable reluctance of publishers to bring books of verse to a tiny market, poets do it themselves with the aid of ubiquitous and cheap(er) computers and printers. Chapbooks abound, some very professional-looking. I like this. It spells a readiness to get on with life, to write even when the work may never have (commercial) viability. It works out well. Drinking and eating are for the taking. Assuming delivery of material will be on time (perhaps a silly assumption, in this silly season of blackouts), New Contrast issue 138 should be available in bookshops later this week; and issue 139 by Christmas. Here are their covers, with art by Sonja Wilker, and ads by the Unpublished Manuscript Press / SnailPress / Carapace. Welcome to New Contrast @ BOOK SA. I’m the new editor – my name is Hugh Hodge. Join me here to discuss writing in New Contrast and anything else you would like to share about the journal. I’m hoping to encourage new writing in any of the country’s languages by publishing stories, poems and articles of quality. To submit, see the contact details here: About New Contrast.